After spending a few days in Colombo, I wanted to move onto the North and headed up to Jaffna, a city which just 6 years ago was in a state of civil war, though you’d hardly be able to tell. I was shocked to find that every train out of Colombo was full for the next 10 days(!) so was forced to take an overnight bus instead. I essentially bought the bus ticket from some random guy at a banana stall in the Wellawatta area of Colombo. I’m not quite sure how it happened but it cost LKR 950 and I got on the bus with no problems. Overnight buses in Sri Lanka aren’t ideal because the island is so small so you arrive at your destination in the middle of the night. Sure enough, we pulled into Jaffna (or ‘Stray Dog Central’) at 4am, though luckily not too far away from my guesthouse, Sarras Guesthouse. The owner was very friendly, which is a common theme in Sri Lanka, and gave me a bed free of charge to rest my head until my room was ready the next day. Jaffna itself is a bit of a ghost town and remarkably quiet and friendly for a place which is recovering from a brutal war. Locals smile at you or stare curiously as you walk the streets and restaurant owners will ply you with tasty, cheap food whilst asking you questions. On the main strip towards the central Jaffna bus station there are plenty of nice eateries with super cheap thalis. The best time to go is in the afternoon as Jaffna pretty much shuts down at night. People are interested in why you’re here and there was a real personal touch to the place. Yes, it’s not exactly rocking and yes, the angry stray dogs look like something out of a horror movie, but it’s the people that make this place, which is pretty much true for the whole of Sri Lanka. 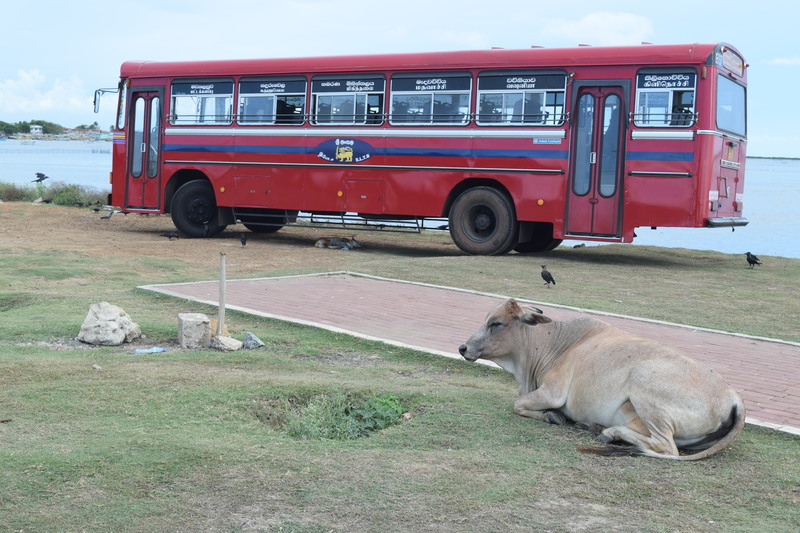 In terms of attractions, Jaffna is a little thin on the ground. Jaffna Fort is certainly worth a look as it’s free and gives you some great views over the peninsula, particularly if the dozens of ravens are circling about. It made for some great photographs. The Nallur temple is also quite interesting and lively. I had to remove my shoes to walk around the grounds and men have to remove their shirts to enter the temple itself, though it’s the outside that’s really easy on the eye, the almost Lego-style exterior mirroring similar designs I’d seen in Southern India. There was a great atmosphere round there as well with lots of locals visiting the temple. 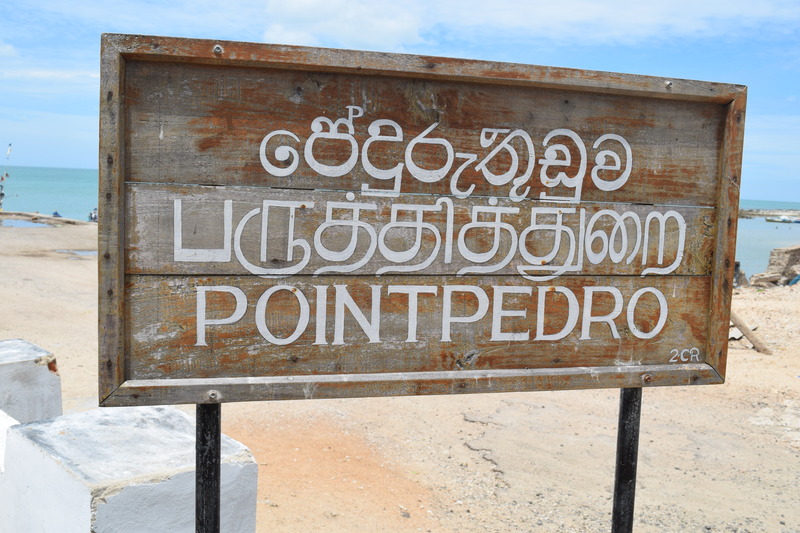 If you want to take a half day trip, jump on bus 88 from the central bus station and go up to Point Pedro, Sri Lanka’s most Northern point. The trip takes an hour and costs about LKR 70 each way. Just a short walk from the Point Pedro bus station (there are a few shops and snack places round here too) is a nice beach and a ‘Point Pedro’ sign which will fulfill all your selfie needs. Handily, there’s also a sign which points out how far Thailand, the Maldives, Australia and other countries are, which certainly satisfied a burning desire on my part. Again, it’s full of curious locals especially on the beach where people seem to live. They didn’t speak any English but the fishermen and children seemed to enjoy sitting with me inquisitively, complete always of course with their warm smiles. For now, I wouldn’t say Jaffna is a “must-see” on a person’s Sri Lanka itinerary, but that’s kind of its charm. It doesn’t claim to anything spectacular, but given less than a decade ago it was ravaged by war, it puts a lot into perspective to see life ticking by with a smile on its face in this charming place. I don’t regret going at all and it’s definitely worth a couple of days of your time in Sri Lanka.